Cut Pillsbury™ dough into 10 equal portions. Gently roll each piece into a round shape and place them on a baking sheet. Press down into the center with a stick to make a little cut. Bake for 20 minutes or until they are golden. Remove from oven and let cool for a few minutes. Cut in half. Add butter and sage leaves to a frying pan on medium heat until the butter melts and starts to sizzle. Keep your eyes on it while you move the frying pan around. It will start to brown in a few minutes, don’t let it brown too much. Remove from heat and season with salt. Set aside. Reheat slices of turkey for a few minutes in the brown butter. Combine cranberry sauce with cut apples and cook for a little to soften the apple. Set aside. To make the sliders, add watercress or arugula to the bottom buns. Add a little cranberry sauce. Add sliced turkey and top with bun. Serve immediately with more cranberry sauce and watercress on the side. You can use thyme or rosemary instead of sage. For a touch of heat, add a spicy sauce to the sliders. As much as we try to avoid leftovers, it seems like we almost always end up with large quantities of turkey, cranberry sauce and other delicious foods after celebrations. We are left wondering what to do with all the leftover food and it’s time to make plans so we can preserve them in the best way possible and reuse them later in creative ways that won’t bore the family with the same flavors. 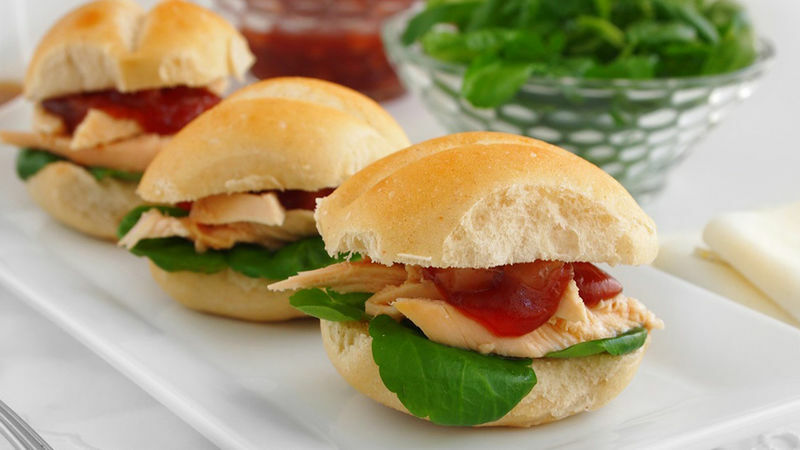 Turkey sliders are very easy to make. The best part of all is that you don’t have to go to the store for burger buns. Thanks to Pillsbury™, you can enjoy fresh bread in no time. This is a great way to enjoy your Thanksgiving leftovers!